When comparing Ann Arbor condo data year-to-date through August of 2016 to that of 2017, little has changed, except in one very important area. The number of new listings that came to the market was 552 in 2016 and 550 this year, basically the same, as with the number of sales, 455 vs. 447. However, the average sale price of Ann Arbor condos has skyrocketed from $203,743 YTD in 2016 to $252,547 this YTD, an increase of $24%! The low supply is keeping demand high, which is raising the average sale price. This is also apparent in the average days on the market which has decreased from 31 to 27. Once we see inventory begin to rise, prices will level out. Keep in mind, spring and summer are the busiest for real estate in general. These numbers may change when data is collected for the whole year. Stay up-to-date with the Ann Arbor Condo market by bookmarking our blog and checking back for new reports. Want to know what your condo is worth or what is going on in your Ann Arbor complex? 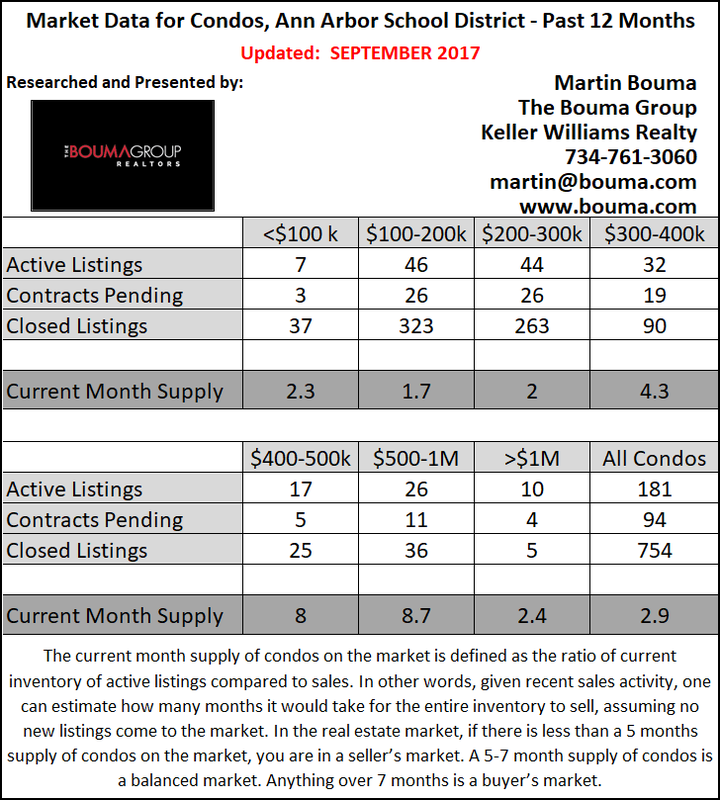 Visit our website or contact us at The Bouma Group, Realtors at 734-761-3060 or email info@bouma.com today!